Mold is considered a bio-contaminant, and its removal should be handled by a trained and certified mold removal professional. 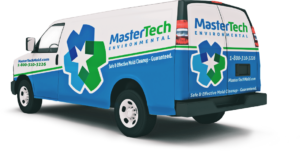 Mastertech of Eastern PA provides home and business owners in Philadelphia and its surrounding counties with the safest and most effect mold removal services in Eastern PA. We have been voted The Best of the Best by Angie’s List! We are A+ rated by the Better Business Bureau and are properly licensed and insured. We provide a 5 year mold-free warranty with every mold removal job and guarantee that we do the job right – the first time. Mold spores that are carried in the air pose a risk of respiratory allergies and distress. They may also spread the mold colony to previously unaffected areas. Containing the contamination is essential to complete removal. Mastertech has the equipment and training to assure proper containment during the clean-up process.